This #ThrowbackThursday could have easily been a #MetsCrushMonday about 15 years ago. Lastings Milledge was drafted out of Lakewood Ranch High School in the 2003 MLB June Amateur Draft, the right handed outfielder was drafted in the first round and 12th overall. The Mets projected Milledge to play right field as a five-tool player. With power to all fields and above average speed, the outfielder was expected to be a run producer as well as a potential gold glover. While the team saw him stealing 20+ bases a year, they knew that his base prowess was hindered and limited by his lack of discipline at the plate. Milledge climbed through the ranks relatively quickly for a High School draftee, he made his debut on May 30th of the 2006 season, less than three years removed from the day he was drafted. In 2006, Milledge appeared in in 56 games with 185 plate appearances and 166 at bats. He hit seven doubles, two triples, four home runs while driving in 22 R.B.I.’s as well as stealing one base. His slash line was .241/ .310/ .380/ .689 with a 78 OPS+ in his rookie season as 21 year old. 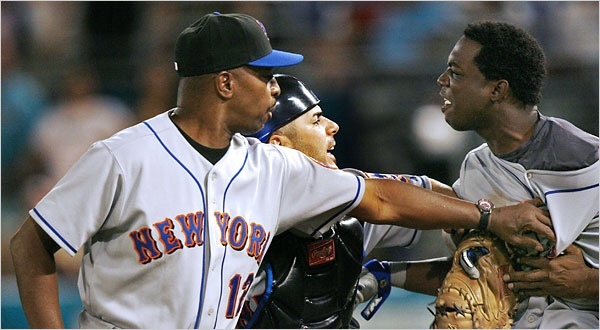 “Baseball Reference” had Lastings Milledge exceeding rookie limits during that ’06 season. 2007 proved to be a better season while wearing the Orange & Blue for Milledge. He had 184 at bats in 206 plate appearances while hitting nine doubles, one triple, seven home runs with 29 runs driven in and three stolen bases. In his 22 year old season, Milledge drastically improved his slash line, hitting .272/ .341/ .446/ .787 raising his OPS+ to 104. Milledge seemed to be outcasted by his peers for being for of an outspoken and flamboyant player, which may have come off as if he were attention seeking or acting like he was a superstar before he’s even completed a full a season. Personally, I loved it. I loved the the flash and I saw him as an extremely passionate ball player, and that’s the guy I want on my team. Overall, Milledge spent parts of two seasons before being traded to the Washington Nationals for outfielder Ryan Church and Catcher Brian Schneider. He’s played 115 games for the Mets, batting a respectable .257/ .326/ .414/ .741 with 11 home runs and 51 R.B.I.’s in 350 at bats and 391 plate appearances. Since mid 2011, Milledge has been playing international baseball with a .272/ .349/ .445/ .793 slash line in 332 games, hitting 47 home runs, 67 doubles, four triples, 181 runs scored while driving in 176 R.B.I.’s in 1252 at bats.